Not many climbers around the world have climbed Everest, and I believe very few have tried climbing his/her first 8000 on the Everest North Ridge Route. There are about 5 UAE residents who have already climbed Everest, and we have at least three more trying this year. However my understanding is that none of these UAE based climbers have climbed Chomolungma from Tibet. My Everest Dream this year is to climb my first eight-thousander on the most difficult route that is climbed commercially these days. There are different reasons why most climbers would opt for the most popular South Col Route to the Top of The World, especially those with none or little experience climbing above 8000m. In this blog post I’m putting together some facts and figures and describing the main differences between the two main climbing routes in Mt Everest. According to my estimations based on the information available from the most popular sources – e.g. Alanarnette – last year we had 395 successful summits from the south and 153 north. This brings the total number of people who have summited Mt. Everest to around 6200, from which around 2500 have multiple summits (mostly Sherpas). About one climber out of four summited from the North, which is the crazy route I chose for my first attempt. The north side has had more altitude and exposure-related deaths above 8000m than on the south side. Last season, Alan Arnette posted a very interesting description of the Everest Routes in his blog, looking at some statistics behind Everest in the past decade up to 2011. The overall member ascent and death rates on the Everest commercial routes (1990-2012) are 36.96 and 1.57 on North Col vs 47.60 and 0.87 on South. The 13% missing is mostly due to turn backs, and that is becoming a serious issue on South side. On May 19, 2012 there were 166 ascents on the South Col route, which means 332 crossings of the Hillary Step (up and down). May 19th was one of the worst nights in Everest history, when six people total died. 4 of them died on the South route at different points close to the Summit, and 2 more on the North (on of them Spanish) under similar conditions. There were about 537 summits in 2011 with 4 deaths, unusually with 3 of those on the south side. So it looks like in the last couple of years the massification of the South route is becoming an issue. Another challenge posed by this route is the long traverse along the North Ridge on summit day. The guide explains that this “means you are covering a lot of lateral distance, which really comes into play on the descent.” Here’s where careful planning becomes so important. Because so much of a climber’s time on the North Ridge is spent negotiating sloping rock and ice at the highest altitudes, he must make sure to have plenty of oxygen and energy for use on the difficult descent—at least as much as he needed to ascend to the summit. Basically, says Simonson, “you have to have enough gas left in your tank (both literally and figuratively) to make the descent. You can’t afford to burn more than 50 percent of your reserves going up, because you’ll definitely need the other half to get down.” The most common problem he’s seen with climbers on the north side is that they underestimate how long it will take them to make the technically difficult, traversing descent to camp from the summit, and they run out of oxygen before they reach the camp. Overall, he explains, “the prolonged time spent at higher altitudes and the time it takes to do that traverse in both directions catch a lot of people off guard on the North Ridge.” Sometimes, it seems, knowing that “it’s all downhill from here” isn’t much of a comfort. · Base camp: 17,500′/5334m: Home away from home. Located on a moving glacier, tents can shift and platforms melt. The area is harsh but beautiful surrounded by Pumori and the Khumbu Icefall with warm mornings and afternoon snow squalls. With so many expedition tents, pathways and generators, it feels like a small village. · C1: 19,500′/5943m – 4-6 hours, 1.62 miles: Reaching C1, is the most dangerous part of a south climb since it crosses the Khumbu Icefall. The Icefall is 2,000′ of moving ice, sometimes as much as 3 feet a day. But it is the deep crevasses, towering ice seracs and avalanches off Everest’s West shoulder that creates the most danger. · C2: 21,000′/6400m – 2-3 hours, 1.74 miles: The trek from C1 to C2 crosses the Western CWM and can be laden with crevasse danger. But it is the extremely hot temperatures that takes a toll on climbers. Again avalanche danger exist from Everest’s West Shoulder that has dusted C1 in recent years. · C3: 23,500′/7162m – 3-6 hours, 1.64 miles: Climbing the Lhotse Face to C3 is often difficult since almost all climbers are feeling the effects of high altitude and are not yet using supplemental oxygen. The Lhotse Face is steep and the ice is hard. The route is fixed with rope. The angles can range from 20 to 45 degrees. It is a long climb to C3 but is required for acclimatization prior to a summit bid. · Yellow Band – 3 hours: The route to the South Col begins at C3 and across the Yellow Band. It starts steep but settles into a sustained grade as the altitude increases. Climbers are usually in their down suits and are using supplemental oxygen for the first time. The Yellow Band’s limestone rock itself is not difficult climbing but can be challenging given the altitude. Bottlenecks can occur on the Yellow Band. · Geneva Spur – 2 hours: This section can be a surprise for some climbers. The top of the Spur leading onto the South Col has some of the steepest climbing thus far. It is easier with a good layer of snow than on the loose rocks. · South Col: 26,300′/8016m – 1 hour or less: Welcome to the moon. This is a flat area covered with loose rock and surrounded by Everest to the north and Lhotse on the south. Generally, teams cluster tents together and anchor with nets or heavy rocks against the hurricane force winds. This is the staging area for the summit bids and the high point for Sherpas to ferry oxygen and gear for the summit bid. · Balcony: 27,500′/8400m- 4 – 5 hours: Officially now on Everest, climbers are using supplemental oxygen to climb the steep and sustained route up the Triangular Face. The route is fixed with rope and climbers create a long conga line of headlamps in the dark. The pace is maddeningly slow complete with periods of full stop while climbers ahead rest, consider the decision to turn back or continue to the balcony. It can be rock or snow depending on the year. Rock fall can be an deadly issue and some climbers now use helmets. They swap oxygen bottles at the Balcony while taking a short break for some food and water. · South Summit : 28500′/8690m – 3 to 5 hours: The climb from the Balcony to the South Summit is steep and continuous. While mostly on a beaten down boot path, it can be challenging near the South Summit with exposed slabs of smooth rock in low snow years. The views of Lhotse and the sun rising to the east is indescribable at this point. Climbers lose radio contact with EBC in this section. · Hillary Step – 1 hour or less: One of the most exposed section of a south side climb is crossing the cornice traverse between the south summit and the Hillary Step. But the route is fixed and wide enough that climbers rarely have issues. The Hillary Step is a short 40′ section of rock climbing, again fixed with rope, that creates a bottleneck on crowded summit nights. Usually there is an up and down climbing rope to keep people moving. · Summit: 29,035′/8850m – 1 hour or less: The last section from the Hillary Step to the summit is a moderate snow slope. While tired, climber’s adrenaline keep them going. · Return to South Col: 4 -7 hours: Care must be taken to avoid a misplaced step down climbing the Hillary Step, the Cornice Traverse or the slabs below the south summit. Also diligent monitoring of oxygen levels and supply is critical to make sure the oxygen lasts back to the South Col.
· Return to C2: 3 hours: Usually climbers are quite tired but happy to be returning to the higher natural oxygen levels regardless of their summit performance. It can be very hot since most climbers are still in their down suits. · Return to base camp: 4 hours: Packs are heavy since everything they hauled up over the preceding month must be taken back down. It is now almost June so the temperatures are warmer making the snow mushy thus increasing the difficulty. But each step brings them closer to base camp comforts and on to their home and families. · Base camp: 17000′ – 5182m: located on a gravel area near the Rongbuk Monastery, this is the end of the road. All vehicle assisted evacuations start here. There are no helicopter rescues or evacuations on the north side or for any mountain in Tibet. · Interim camp: 20300′/6187m – 5 to 6 hours (first time): Used on the first trek to ABC during the acclimatization process, this is a spot where a few tents are placed. Usually this area is lightly snow covered or none at all. · Advanced base camp: 21300′/6492m – 6 hours (first time): Many teams use ABC as their primary camp during the acclimatization period but it is quite high. This area can still be void of snow but offers a stunning view directly at the North Col. It is a harsh environment and a long walk back to the relative comfort of base camp or Tibetan villages. · North Col or C1: 23,000′/7000m – 4 to 6 hours (first time): Leaving Camp 1, climbers reach the East Rongbuk Glacier and put on their crampons for the first time. After a short walk, they clip into the fixed line and perhaps cross a few ladders that are placed over deep glacier crevasses. The climb from ABC to the North Col steadily gains altitude with one steep section of 60 degrees that will feel vertical. Climbers may use their ascenders on the fixed rope. Rappelling or arm-wrap techniques are used to descend this steep section. Teams will spend several nights at the Col during the expedition. · Camp 2: 24,750′/7500m – 5 hours: Mostly a steep and snowy ridge climb that turns to rock. High winds are sometimes a problem making this a cold climb. Some teams use C2 as their highest camp for acclimatization purposes. · Camp 3: 27,390′/8300m – 4 to 6 hours: Teams place their camp 3 at several different spots on the ridge since it is steep, rocky and exposed. Now using supplemental oxygen, tents are perched on rock ledges and are often pummeled with strong winds. This is higher than the South Col in altitude and exposure to the weather. It is the launching spot for the summit bid with some teams spending the night or just a few hours. · Yellow Band: Leaving C3, climbers follow the fixed rope through a snow filled gully; part of the Yellow Band. From here, climbers take a small ramp and reach the northeast ridge proper. · First Step: 27890′/8500m: The first of three rock features. The route tends to cross to the right of the high point but some climbers may rate it as steep and challenging. This one requires good foot work and steady use of the fixed rope in the final gulley to the ridge. · Mushroom Rock -28047′/8549m – 2 hours from C3: A rock feature that spotters and climbers can use to measure their progress on summit night. Oxygen is swapped at this point. The route can be full of loose rock here adding to the difficulty with crampons. Climbers will use all their mountaineering skills. · Second Step: 28140′/8577m – 1 hour or less: This is the crux of the climb with the Chinese Ladder. Climbers must first ascend about 10′ of rock slab then climb the near vertical 30′ ladder. This section is very exposed with a 10,000′ vertical drop. It is more difficult to navigate on the decent since you cannot see your feet placement on the ladder rungs. This brief section is notorious for long delays thus increasing the chance of frostbite or AMS. · Third Step: 28500′/8690m – 1 to 2 hours: The easiest of the three steps but requires concentration to be safe. · Summit Pyramid – 2 to 4 hours: A steep snow slope, often windy and brutally cold, climbers feel very exposed at this point. 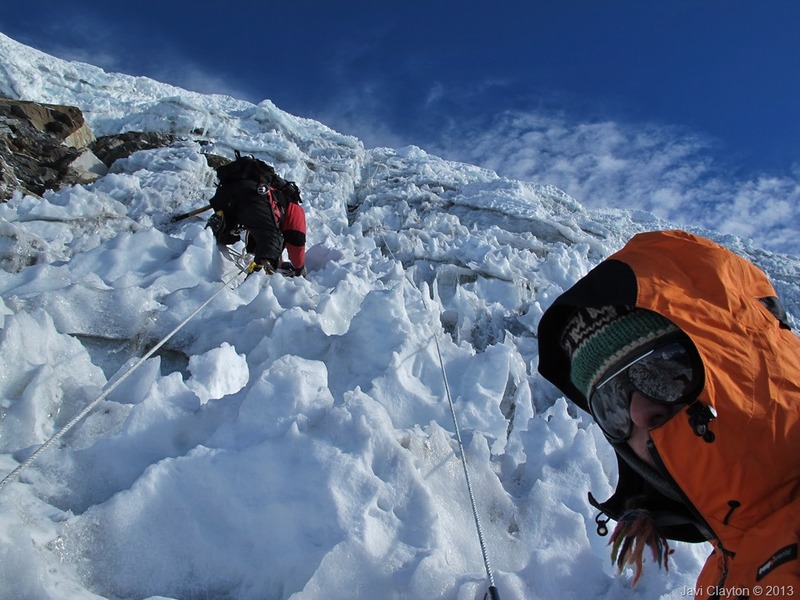 Towards the top of the Pyramid, climbers are extremely exposed again as they navigate around a large outcropping and experience three more small rock steps on a ramp before the final ridge climb to the summit. · Summit: 29,035′/8850m – 1 hour: The final 500′ horizontal distance is along the ridge to the summit is quite exposed. Slopes angles range from 30 to 60 degrees. · Return to Camp 3: – 7 -8 hours: The down climb takes the identical route. Early summiters may experience delays at the 2nd Step with climbers going up or summiters having down climbing issues. · Return to ABC: 3 hours: Packs can be heavy since everything hauled up over the preceding month must be taken back down. It is now almost June so the temperatures are warmer making the snow mushy thus increasing the difficulty. But each step brings them closer to base camp comforts and on to their home and families. Mt. Everest was first summited by Sherpa Tenzing Norgay and New Zealander Edmond Hillary with a British expedition in 1953. They used the South Col route. At that time the route had only been attempted twice by Swiss teams in the spring and autumn of 1952. They reached 8500m well above the South Col. Of note, Norgay was with the Swiss thus giving him the experience he used on the British expedition. The Swiss returned in 1956 to make the second summit of Everest. The north side of Everest is steeped in history with multiple attempts throughout the 1920’s and 1930’s. The first attempt was by a British team in 1921. Mallory led a small team to be the first human to set foot on the mountains flanks by climbing up to the North Col (7003m). The second expedition, in 1922 reached 27,300′ before turning back, and was the first team to use supplemental oxygen. It was also on this expedition that the first deaths were reported when an avalanche killed seven Sherpas. The 1924 British expedition with George Mallory and Andrew “Sandy” Irvine is most notable for the mystery of whether they summited or not. If they did summit, that would precede Tenzing and Hilary by 29 years. Mallory’s body was found in 1999 but there was no proof that he died going up or coming down. A Chinese team made the first summit from Tibet on May 25, 1960. Nawang Gombu (Tibetan) and Chinese Chu Yin-Hau and Wang Fu-zhou, who is said to have climbed the Second Step in his sock feet, claimed the honor. In 1975, on a successful summit expedition, the Chinese installed the ladder on the Second Step. Tibet was closed to foreigners from 1950 to 1980 preventing any further attempts until a Japanese team summited in 1980 via the Hornbein Couloir on the North Face. The north side started to attract more climbers in the mid 1990s and today is almost as popular as the South side when the Chinese allow permits. In 2008 and 2009, obtaining a permit was difficult thus preventing many expeditions from attempting any route from Tibet. I’ve recently approached our Expedition Leader Phil asking for advices on how to get connected via the 3G cellular networks in China, since we are climbing North Side. The answers were pretty much straight forward: 3G is too difficult and expensive, while satellite comms are not possible due to the Mighty E projecting an electromagnetic shadow in Base Camp (5200m). There is however the possibility to get Inmarsat BGANs connected from Advance Base Camp (6400m) but power sources will be limited to a set of portable solar panels and therefore Internet usage will be restricted to pull out weather forecast data and sending the official dispatches. Besides being an adventurer and crazy Spaniard, I’m an IT Geek, and when someone says “it’s not possible” I feel like taking the challenge and proving they’re wrong. I don’t know much about the experiences from guys like me going on North Face of Everest with BGAN modems or simpler devices, but I don’t think is such a challenge as explained by our Expedition leader today. He is probably the most experienced Everest climber and guide in the Tibet side these days, but I’m also very experienced on finding Solutions to IT challenges anywhere in this world. Now I feel like not only climbing that mountain but also proving there is no “Impossible” when it comes to IT. It’s just a matter of finding the right formula. For the last 15 years I’ve been working in the IT arena doing all sort of things, from fixing old CRT computer monitors, to setting up an IP videoconferencing network all around Spain allowing deaf people to communicate from the distance using their natural sign language. Today I’m employed by a large Blue Chip company in Dubai and I work with Telcos all around the world supporting Hosting Solutions to satisfy their customer’s needs. My aim is to work with these Telcos building Messaging and Collaboration Solutions that enable businesses and individuals being connected and productive no matter where they go. As Solution Support Engineer, finding solutions is all about me, not only at work but in all aspects of my life. This year I’m taking to my Expedition a couple of devices with the brand new Windows 8 operating system (Microsoft Surface and Windows Phone, no laptops of complex toys), and I’m determined to find solutions and get them connected to the Internet, at least to send my own expedition dispatches and updates on the social media, but primarily to satisfy my IT Geek needs and finding the right formula to stay connected up there. As Altitude Junkie I like to spend my time in the clouds, not only climbing but also flying with a light paraglider and help from the wind. I’m just a newbie but there are so many good pilots out there… and recently I’ve had the opportunity to meet Geoff Davison, Product Manager for Thuraya Telecommunications Company. Thuraya is a world-leading mobile satellite service provider of voice, data, maritime, rural telephony, fleet management and other telecommunication solutions in remote areas. 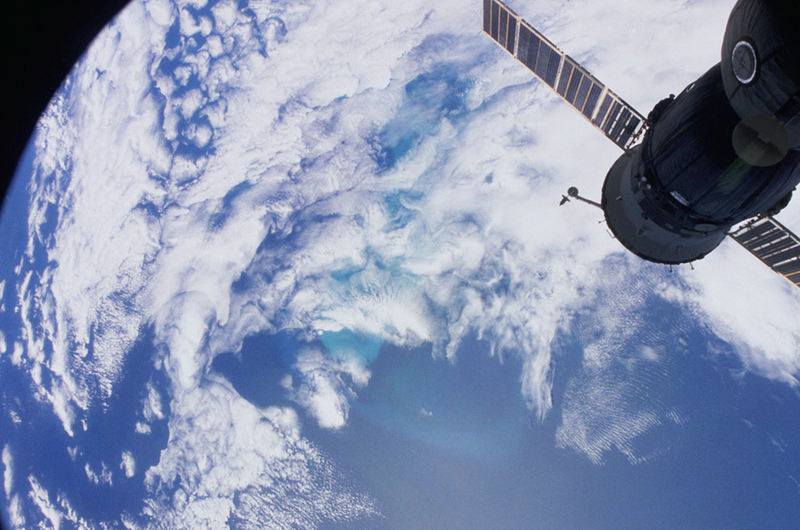 They provide mobile satellite communications to over 140 countries around the world, offering a congestion-free network that covers most of the planet, encompassing Asia, Africa, Australia, the Middle East and Europe. Thuraya not only delivers a set of incredible products and services, but also they have the know-how and experience required to help me finding that formula and getting these devices connected from Base Camp, proving there is no “Impossible” when it comes to IT. Geoff is committed to help me becoming a good pilot and finding Solutions to stay connected from the Mighty E.
From today I will start describing the process to break communication barriers during complex expedition in extreme natural environments such as the one we’ll find on our journey up to the Top of the World from April 2013. Would you IT Geeks be interested on investigating solutions and coming up with a case study starting from today and finishing on the summit of Mt Everest? Subscribe to my blog to receive updates and use the contact form to send me all suggestions and ideas. Last summer I was fighting to get to the top of my first 7000m, Khan Tengri, The Lord of the Sky. Meanwhile my friend Gerard was fighting to defeat cerebral cancer. I could not get any higher than 5500m since the mountain refused to let us climb. And my friend could not get any further than two weeks after he was diagnosed, since the illness was not treated at the right time. My uncle Verna, his brother Goyo and my godmother Julia were all at the same time fighting cancer, and today we can happily say they made it to the summit of what it is the highest mountain one can climb. My neighbor Juan is a warrior, someone like Reinhold Messner (the greatest climber in history). He is the person I know who has climbed more 8000. Not those in the Himalayas, but the ones that are higher and must be climbed from the bed of a hospital room. He’s got frostbite several times, and he complains because he does not like the scars. But I think they are pretty cool considering the sort of battles he won. He is still descending from his last 8000, but we all know he’ll remain strong and will make it save back to Base Camp. For all my family, my friend Gerard and Juan, I want to climb the highest mountain in the Himalayas and raising funds towards investigation cures for Cancer, and defeating the highest mountain not from the hospital room but from the lab in the research room. Cancer Research UK is the world’s leading charity dedicated to beating cancer through research. They are fighting cancer on all fronts, finding new ways to prevent, diagnose and treat it to save more lives. They are entirely funded by the public. Cancer Research UK pioneers life-saving research to bring forward the day when all cancers are cured. Donating through JustGiving is simple, fast and totally secure. Your details are safe with JustGiving – they’ll never sell them on or send unwanted emails. Once you donate, they’ll send your money directly to the charity and make sure Gift Aid is reclaimed on every eligible donation by a UK taxpayer. So it’s the most efficient way to donate – I raise more, whilst saving time and cutting costs for the charity. When I tell my friends that I’m a climber, normally they ask what sort of climbs I do, or what sort of techniques and terrains are involved in the activity. 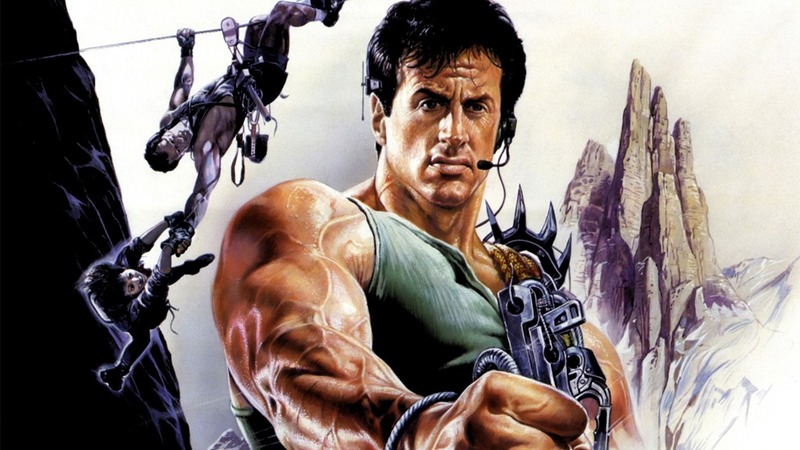 The totally strangers to the subject imagine me hanging from a rope, with black leader globes and a muscle shirt. 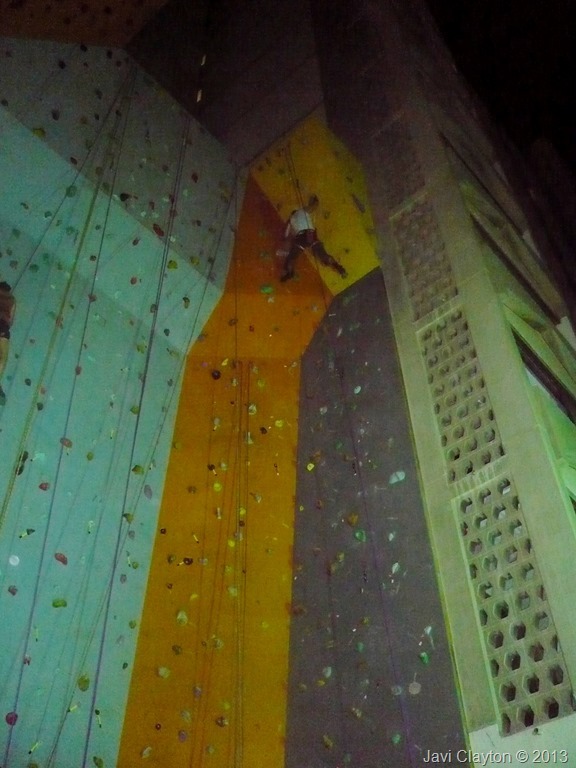 Indoor Climbing: With indoor rock climbing, you can train all year round and improve your climbing skills and techniques. For beginners, this activity will give you an idea of what the actual Rock Climbing is. Traditional Climbing: Traditional or Trad Climbing involves taking rock climbs in routes which do not have permanent anchors to help climbers when ascending. 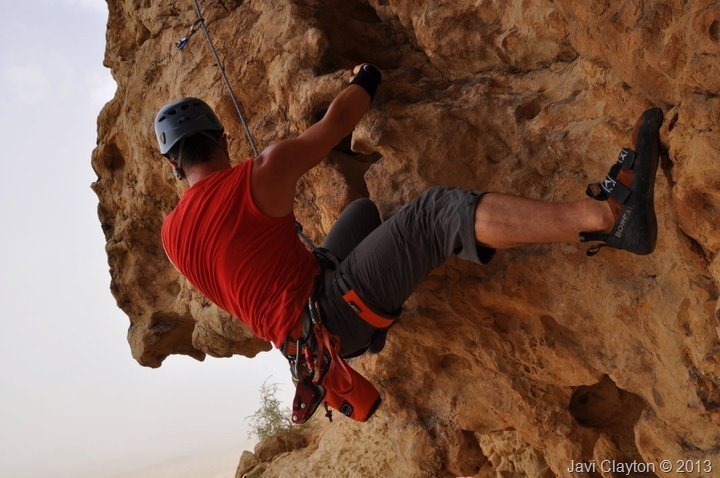 Sport Climbing: Unlike Traditional Rock Climbing, Sport Climbing involves the use of protection or permanent anchors which are attached to the rock walls. Bouldering: This is a type of Climbing where you don’t need to leave more than twelve feet off the ground. Know the History of Bouldering, Art of Spotting, and the different Bouldering Competitions. Solo Climbing: Solo Climbing is the freest and most dangerous type of Climbing. In a nutshell, this is climbing alone, without a partner and rope or protection.. 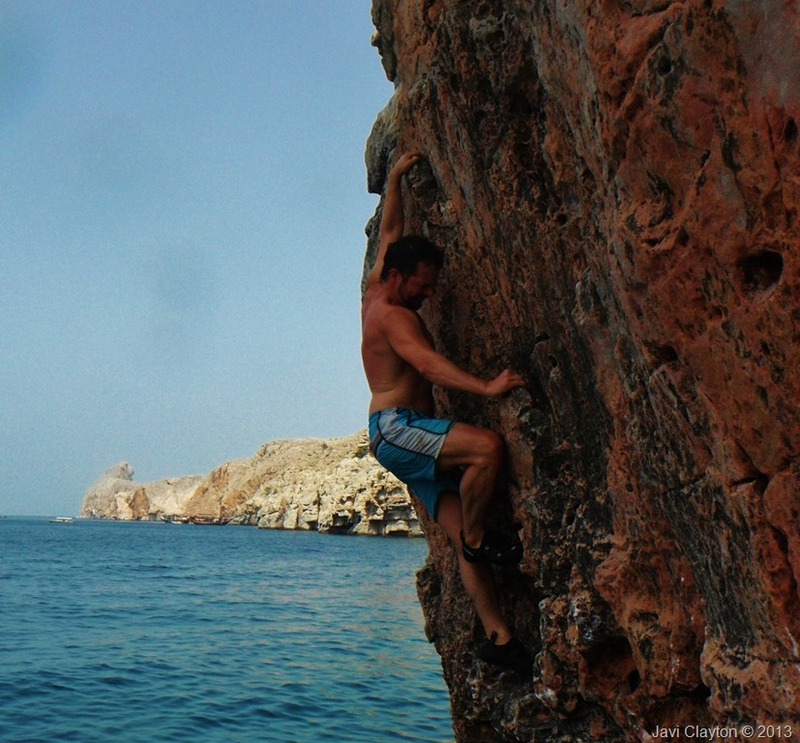 Deep Water Soloing: There are a lot of climbing styles, and Deep Water Soloing (DWS) is one of them. Having to climb a rock and fall on deep water sets it apart from the other styles. Ice Climbing: This Rock Climbing style involves cold and ice which climbers should deal with. Learn more about Ice Climbing and know if you have what it takes to conquer ice. Scrambling: Scrambling basically uses hands and feet, when going up ridges, rock faces, or buttresses. Its main feature is the freedom it offers from the use of the different pieces of climbing equipment. Hiking: Is an outdoor activity which consists of walking in natural environments, often in mountainous or other scenic terrain. People often hike on hiking trails that are clearly marked to facilitate the activity. Mountaineering: This challenging activity involves hiking or trekking in higher altitudes. It requires different skills in climbing and outdoor survival. Mountain climbing or Mountaineering is for me the ultimate challenge. Climbing some mountains can be an extraordinarily complex activity that requires extensive preparation and the orchestration of multiples resources. When climbing at high altitude, every single aspect of the whole climbing experience becomes an enormous challenge where all details during training, preparation and the ascent, must be executed with absolute precision. Mountain climbers can’t afford being mediocre and must develop physical and mental endurance, as well aa technical excellence in order for them to progress in difficult terrains and extreme weather conditions. Many of the techniques develop by climbers in the groups listed in the previous lines, are combined with survival skills, project management, meteorology, navigation, and paramedicine. When we think about all these factors around the climbing activity in a specific mountain, we come up with the controversial concept of Ascent Styles. Both mountain climbers and enthusiasts of outdoor sports consider the Ascent Style a crucial success factor, and many of them believe it’s the only measure of the climber’s ethics and reputation. In my humble opinion, there are too many of these climbers and followers with not enough experience or good criteria to set the standards of what can be considered a true mountaineering activity and remarkable ascent. Alpine: Is the most pure, clean and hard form of climbing. Going from basecamp to summit directly and carrying everything required. Previous acclimatization is required. This can be achieved in other mountain, or even in a different and easier route of the same mountain. In the most pure form of Alpine climbing there is no use of tents, and the climbing is done day and night with non-stop. Alpine climbing is however not always the best strategy in certain mountains. More weight allows for more options, less weight allows moving faster. Capsule style: Is a variant of the Alpine style used in routes with high technical difficulties, and its based on the techniques used to open big walls. There is a camp established at the point where difficulties start. The camp has all material required for the whole expedition. From there we move up in the route the time required to finish with all ropes available to protect the route, and we descent to the camp every night. Once we finish the rope, we move the whole camp and we recover the rope to continue with the same strategy. Normally on the summit push the route is not fully protected as before, but alpine techniques are used instead. Once the ascent finished, the whole camp must be dismantled and taken down. Normally on the way up we prepare abseiling points to facilitate this. It’s a very slow process which facilitates acclimatization. Heavy or Expedition style: From Base Camp (BC) climbers and/or porters and guides prepare and provision advanced camps. The distance between these can be easily covered in just one day. The difficult sections are protected with fixed ropes and bamboo flags, which are used to mark dangerous places and facilitated the progression and descent in difficult conditions. All this process helps acclimatizing. Once all camps are ready and climbers are acclimatized, a weather window is set to execute the summit push. Combined style: Climbers can do things like starting with Heavy style, then Capsule, and finishing with Alpine. Guided: One or mode guides work on installing ropes and camps, supervising all actions and taking care of security. There are normally two or three climbers per guide and a maximum ratio of 4:1. Some guided Heavy expeditions go beyond that ratio, leading to controversy and risks exposing all other climbers and professionals in the same mountain. Guided individually: Normally this means no autonomy for the client climber. It is however a fantastic learning opportunity when the guide focuses the activity in knowledge transfer. Leaded: A guide takes care of all logistics up to BC or Advanced BC (ABC), being responsible for directing the rope fixing and installation of camps, but not responsible for security of climbers. Climbing leaders must be able to advise climbers via radio at all times. Consulted: Same as leaded, but with no actions to be taken by the consultant from BC, such as organizing rope fixing and camps. Consultants must however be available for emergencies. 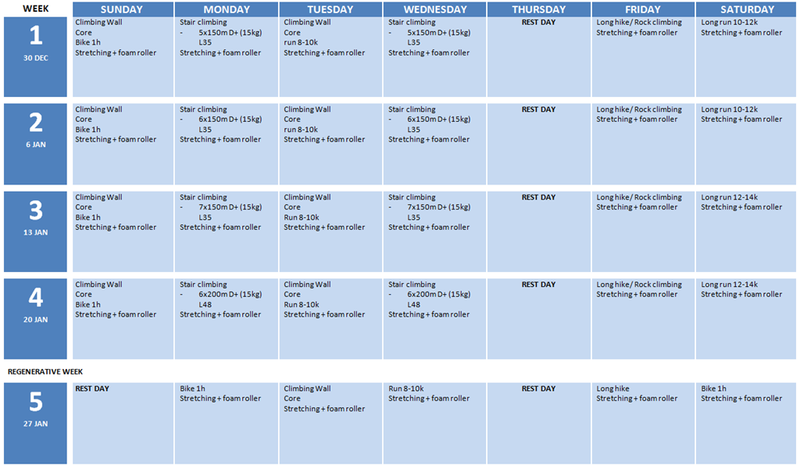 Following up with my previous post, and to please all those who asked me specific details about my training plan, today I’m sharing the training schedule I built with the help of my friend Ismael Blanco six weeks back. Ismael is a certified Master Trainer on Functional Training, and he holds many years of experience working as personal trainer in Dubai and Spain. These are very simple and effective rules I strictly followed during the last five weeks. Breakfast should provide at least 20-25% of the day’s energy intake, lunch 35-40%, dinner 25-30% and the snacks about 10 to 15%. Cereal products, potatoes and dried vegetables should be taken as main source of carbohydrates, and make up more than half of the daily energy intake. 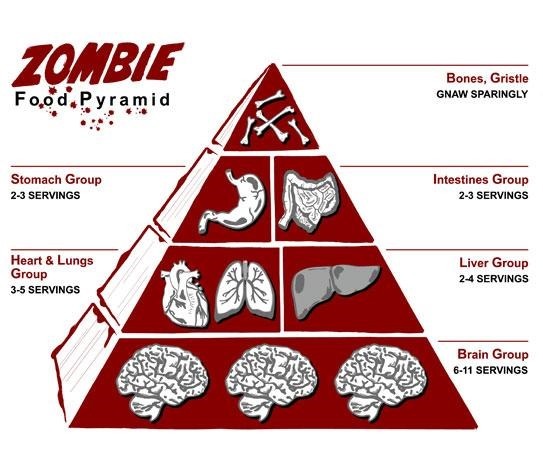 Every day include at least two foods from the “meat, fish, eggs” group in your menu for the protein and iron content. I try to avoid meat at night, and I have fish only I haven’t during the day. Legumes are high GI foods, those that release glucose more slowly and steadily and thus more efficient for energy recovery after exercise, and they are among the best protein sources in the plant kingdom. Glucose and high GI carbohydrates (those that quickly raise blood sugar levels) , combined with proteins if possible, to resynthesize muscle and liver glycogen reserves. Proteins to ensure repair of muscular micro-lesions arising during exercise. Electrolytes to compensate for losses through perspiration and to avoid cramps. Vitamins to restore losses caused through exercise. Diet must be rich in medium GI carbohydrates. Eat as loads of pasta and rice, combined with food from the other groups of food (Meat/fish + Vegs + Fruit (4-5 fresh/dried) + Healthy fats (nuts/olives/avocado/olive oil) + yogurt/cheese/eggs). The last meal 2 hours before training must be low in lipids and dietary fiber, to facilitate the digestion and prevent gastric annoyances from appearing during the training session, and rich in carbohydrates with medium to high GI foods. Intake while waiting (2 h to 30 min before the event) consists of drinking water every 30 minutes, maybe accompanied by biscuits, cereal bars, a yogurt and/or a very ripe fruit. 30 to 15 minutes before the start of the training session, I have 250ml of Gu Electrolyte Brew and one Gu Energy Gel. For the last few weeks I’ve incorporated the amazing set of Gu Performance products as an supplement before, during and after the training. During the 3h endurance training I have 700ml Roctane Ultra Endurance brew (Lemon Lime) plus one Roctane Ultra Endurance Energy Gel (Blueberry Pomegranate) in the middle of the session. 700ml is not enough for 3h of extremely intensive training, sweating like hell in the staircase, so I have an additional 500ml bottle with one Electrolyte Brew Tablet (Lemon Lime) to drink in between sets during the 1min rest time, and on my back back home I have some extra. Right after I get home and finish my shower, I have 500ml GU Recovery Brew (Strawberry Watermelon) while I’m doing 1h stretching and foam roller session. All flavors I tested so far are delicious, with the exception of the Electrolyte Brew Tablet that I put in a North Face bottle, which tastes like plastic, but its fine in aluminum bottles, not my favorite though. Orange is simply delicious and my friends love it when we go hiking. The Blueberry Pomegranate Roctane Gel is kind of weird, but not bad at all, while the other flavors are all very natural. First time I had a Peanut Butter Gu Enery Gel 15 minutes before training, I thought the taste is so good that I wanted to have few more. 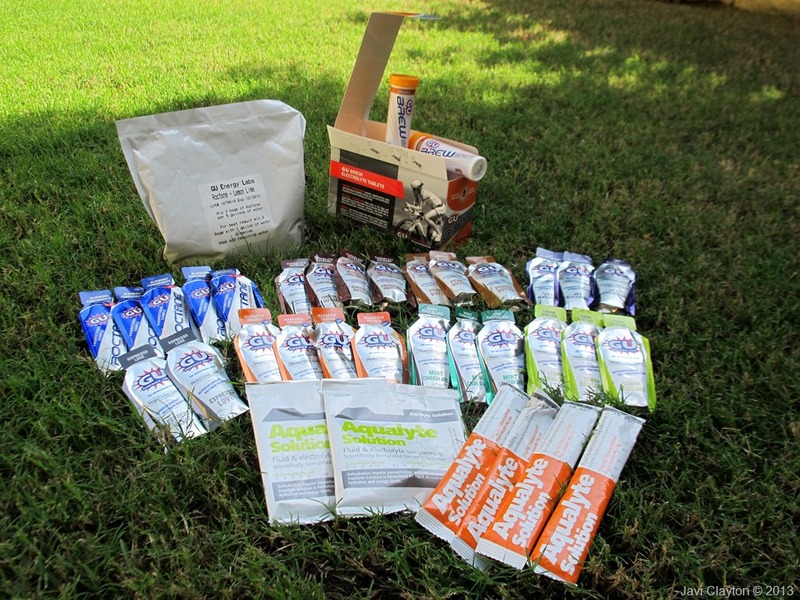 I love having a big range of flavors since otherwise I´d get tired of using these supplements during my Everest expedition. Gu Pure Performance Energy products are distributed in UAE by Sport In Life, distributors of Polar Heart Rate Monitors, 2XU Performance Gear, Zefal, Nathan Sports, and Aqualyte. They have a nice online shop SportSouq.ae and Facebook page to keep us updated with events and their passion for sport. Today I’m very happy to say I’m proudly sponsored by Sport in Life, and we are working together to find the best combination of performance products that help me achieving my training goals and reaching the summit of Mt Everest.